It was a cool morning following a night of rain. We decided that there was time for a short hike. Parking on Riverside Place we walked the path down to the east bank of the Credit River. We thought we just might find evidence of Timothy Street’s mill, after which the town of Streetsville was named. Streetsville has retained it’s small town feel even as it has been surrounded by the city of Mississauga. In 1953 two of the first suburbs in Canada were built near Streetsville. The one on the north east was called Riverside and opened in 1955. The park at the bottom of the hill along the river may have contained the mill pond. 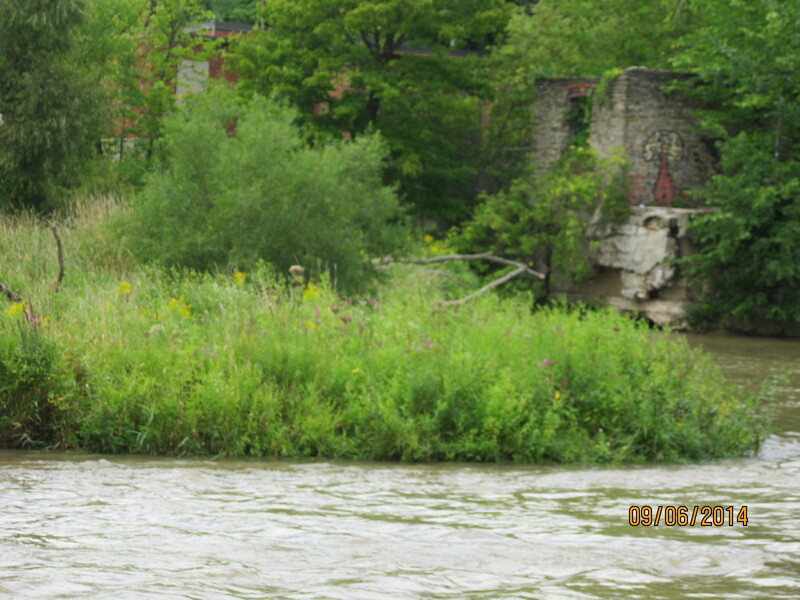 The tree in the cover shot is a massive black willow that stands near the side of an old mill race. It is likely over 100 years old and witness to many changes in the river valley. We watched a female downy woodpecker looking for lunch on a dead tree. The downy is the smallest woodpecker in Ontario. The males can be distinguished from the females by the red cap on the back of the head. The downy and the hairy woodpecker look almost identical, yet they come from different genera. Downy woodpeckers average about 6 inches while the hairy is normally around 15 inches in size. They have the same markings except the white feathers on the tails. Being unrelated they cannot inter-breed raising the question as to why they look so much alike. Scientists use the term “convergent evolution” to describe two apparent random sets of independent mutations that, against all odds, somehow produced the same result. The Goldenrod Gall Fly is a small brownish fly that lives it’s entire life cycle around the plant. In the spring the male will wait on a plant for the female to arrive so he can dance for her. After mating she deposits her eggs directly into the stem of the young goldenrod plant. The eggs hatch in about 10 days, roughly the same time as the adult completes it’s two week life cycle and dies. The larva live their whole lives inside the plant where they chew a nest. Their saliva causes the plant to grow a gall around the larva, up to the size of a golf ball. Just before winter the larva will chew an escape tunnel out almost to the outer skin. Then it converts most of its body fluid to glycol, a substance like anti-freeze, and sets down for the winter. In the spring the larva wakes up and molts into the pupa from which the adult fly will hatch. The adult will escape through the tunnel it dug the fall before. When it reaches the end of the tunnel it inflates special pouches in it’s head to “blow apart” the skin of the gall. The male fly then begins its two week life cycle on the outside. 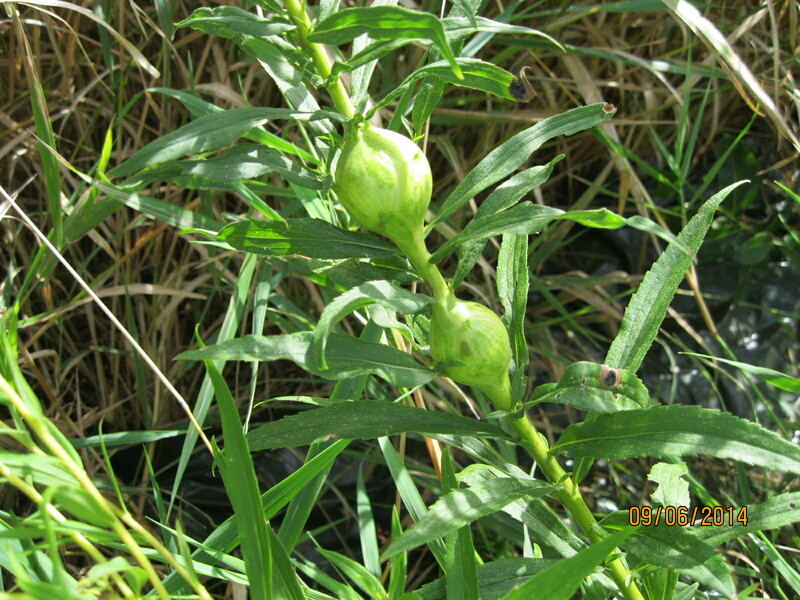 Goldenrod galls are easy to find but it is rare to see two galls on a single plant. 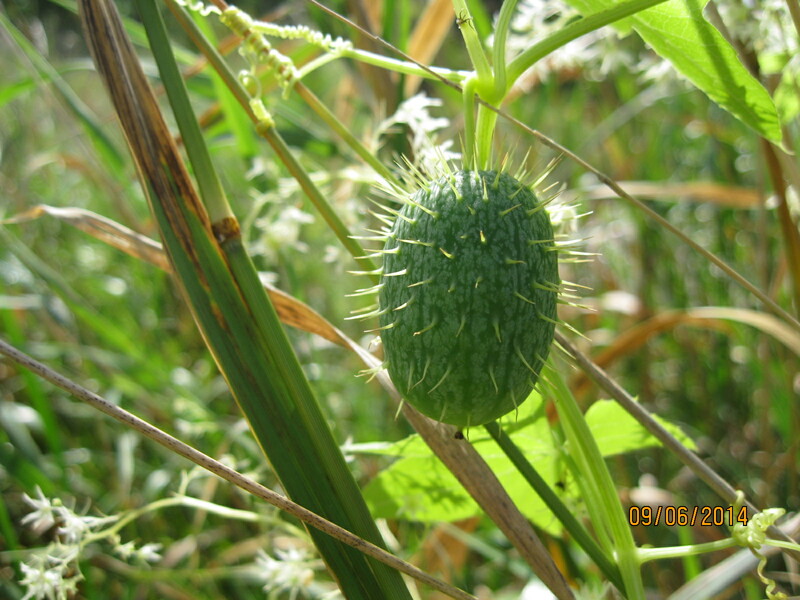 Wild cucumbers grow along the edges of Toronto’s rivers and streams. They are related to cucumbers, squash and other gourds but unlike other members of it’s family, are not edible. The fruit will contain 4 seeds which drop out of the bottom after the pod has ripened. The plant dies each fall and re-grows in the spring from the seeds of the year before. 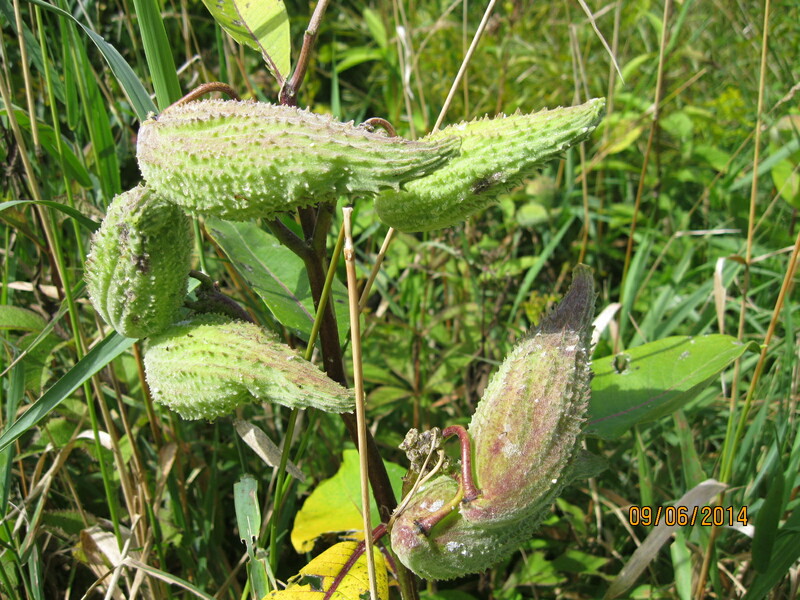 Milkweeds produce a pod which contains hundreds of little seeds. These little seeds each have a silky tassle which allows them to be blown by the wind to aid distribution. Milkweed is essential to the life cycle of monarch butterflies. They lay their eggs on the plant and the emerging caterpillars eat it. Monarch butterflies travel 4,800 km to Mexico to winter every year. In the winter of 2013-2014 only 44% of the butterflies arrived compared to the year before. In order to improve the future of these butterflies the David Suzuki Foundation has a program promoting the planting of milkweed in Toronto. 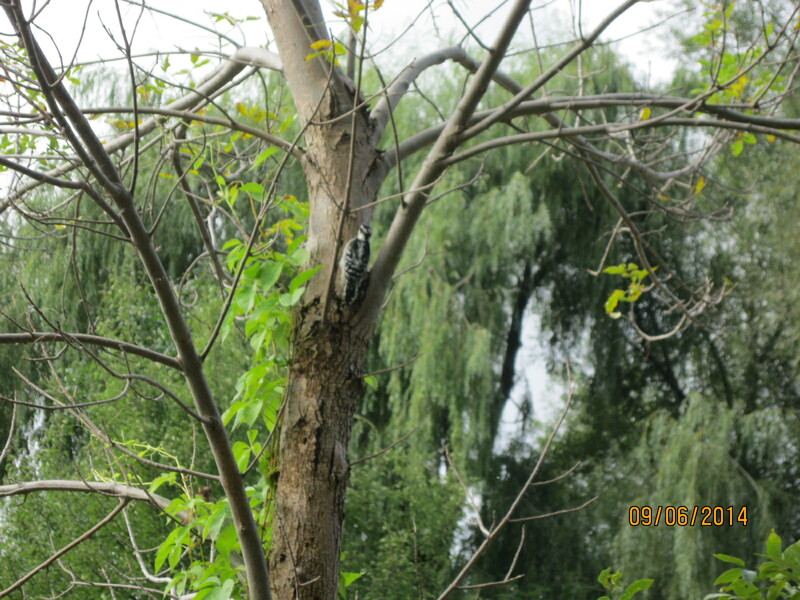 This entry was posted in Credit River and tagged Credit River, Downy Woodpecker, goldenrod, GTA, Hiking, Misissauga, Streetsville on September 9, 2014 by hikingthegta.